Hiya, y’all! Sorry about the wait; these were supposed to go up yesterday, but then central Illinois decided to have an ice-storm and the power went down. The good news is that I returned to my mailbox to find a lot of replies, so I’ll get them up lickety-split. First off, I hope you’ll welcome a first-time Patrick’s performer, Erinn Liebhard! A regular performer with the jazz dance company Eclectic Edge Ensemble, the Wild Goose Chase Cloggers, and various pick-up projects, Erinn just came off of co-producing, choreographing, and dancing in Rhythmically Speaking. 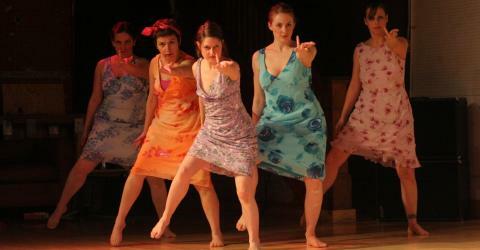 A sold-out jazz choreographer’s collective show held at Minneapolis’ Bedlam Theatre in August 2009, Rhythmically Speaking was “an answer to the quiet but persistent call to get some quality jazz choreography out on the stage in the Twin Cities once more” after the disbanding of JAZZDANCE in 2004. Erinn was enthusiastic about the result, saying that it was “definitely a highlight of my career thus far!” and that there are plans for a similar show in May. Keep your eyes out!